GiPro is rugged, 100% weatherproof and comes with 2-year replacement warranty. 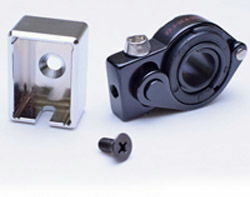 For all Hondas without electrically driven speedos as standard (but which do have an electrically/electronically driven Tacho/Rev-counter) the GiPro Wheel Speed Sensor (WSS-Type) comes with a magnetic pickup convertor included to provide the electrical pulse required to activate your gear indicator. Please note the WSS units are universal and not model specific, but installation has been made as simple as possible.